Hello everyone! I know, I know..."Joe, you are quite a bit late on the February verification post!" There were so many different routes that I couldn't decide to take on this that it left me confounded. One thing that I'd like to touch base on was the 3 day ROC scores for the Northeast during February. Astonishingly good would be the best way of describing it! As you can see above, not only did the 3 day ROC of the BSR nail the pattern overall during February, but it literally had a 1:1 correlation on multiple days! The 7 day pattern correlation of the ROC shows the high correlation even better with score verification. The first 5 days of the month showed this as it pertained to the BSR 500mb map. As you can see above, the Western ridge/Eastern trough was foretold. The trough was focused over Quebec, extending into most of the Eastern US, and the ridge was focused over the Intermountain West. The above graphic from the ESRL daily composite site, with a focused point of the US, shows the ridge verified SE of the BSR while the trough apex was split between Newfoundland and James Bay. The ridge extending to the SE coast nullified the minimal BSR below normal look South of the Mason-Dixon line. The next event I will bring up is the February 7th, 2017 severe weather that hit the Gulf Coast. The idea which the BSR started to paint was one which had a system develop over the lee of the Rockies and move East affecting the gulf region. 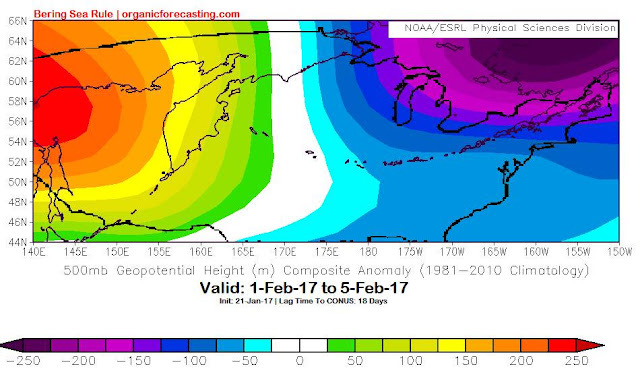 The first "official" hint on the organicforecasting.com BSR section was January 16th, 2017 with the 96hr OPC forecast overlay. While these overlays were produced on January 21st, 2017 based on 500mb analysis. Almost immediately afterwards, we saw the potential for a strong storm to hit the Northeast via the next system based on the 96hr OPC forecast overlays starting on the 18th of January, 2017. These maps are based on 500mb analysis once again. Compare the maps for February 10th to what the Weather Prediction Center had for Days 5 & 7 forecast of February 9th on the left side of the next two pictures! On the Accuweather.com forums we have "adopted" a naming strategy to storms which the BSR nails..."Dark Knight Blizzard" as my nickname is the "Dark Knight" dating back to the January 20th, 2016 storm. This is the forecast thread, while here is the OBS thread for the DKBIII storm. 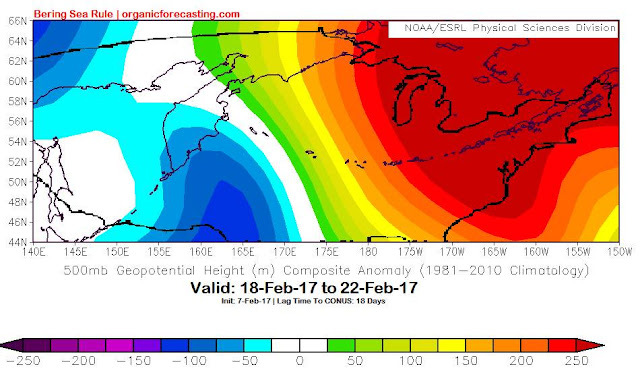 I will reference something that was brought up in the weatherboy.com article dated February 12th, 2017. This is a warm pattern upcoming for much of the U.S., especially east of the Rockies. In the 10 day period ending around the 22nd of this month, many areas of the country will be 10 degrees above normal with some as high as 20 degrees above normal. Though New England will be the slowest to warm, after the current blizzard departs, temperatures will soar even there to well above normal readings about a week from now. While they warm slowly in New England, temperatures in the Midwest, Great Lakes and South will be well above normal for much of this upcoming week. “A strong area of high pressure over the North Pacific near the Gulf of Alaska retrograded, meaning it headed west, instead of the normal east that most weather systems take (in late January) and this teleconnected to a ridge of high pressure off the Southeast coast heading west and dominating the eastern US,” explains Renken. This type of weather pattern encourages a strong west to east flow across the Lower Forty Eight and will combine with the much stronger than normal Pacific jetstream to allow warmth to dominate. Below you can see the Des Moines, IA data for the period of February 1st-22nd. I placed the 10 day period from the 12th-22nd in red squares. Even though I didn't see the departures get larger than 20° above normal, the pattern was foreseen and warned about. I suspect that the raging Pacific jet that I spoke about added extra moxie to the pattern. While the pattern indicates a warm stretch of weather, a change is also likely around the 20th of the month. “This very well could be another severe weather outbreak with the Southeast with the Gulf Coast states being the area seeing the greatest threat for severe weather,” Mr. Renken stressed. Even though the outbreak didn't come true due to mesoscale features not lining up, the potential was there and foretold. Here are the reports from the 19th. The SPC outlooks for the remaining days. BSR map created on February 3rd, 2017. Note the ULL over West Texas, the corresponding ridge over the Deep South, another ULL off the SE coast and the Mid-Atl. The West Texas ULL hasn't closed off yet in the OBS, but the ridge is created ahead, ULL between Bermuda and the Bahama's, and the last ULL over Nova Scotia. A look at the BSR ESRL generated map for the 18th-22nd. This is the corresponding OBS at 500mb. This storm will be followed by a change to more normal temperatures. 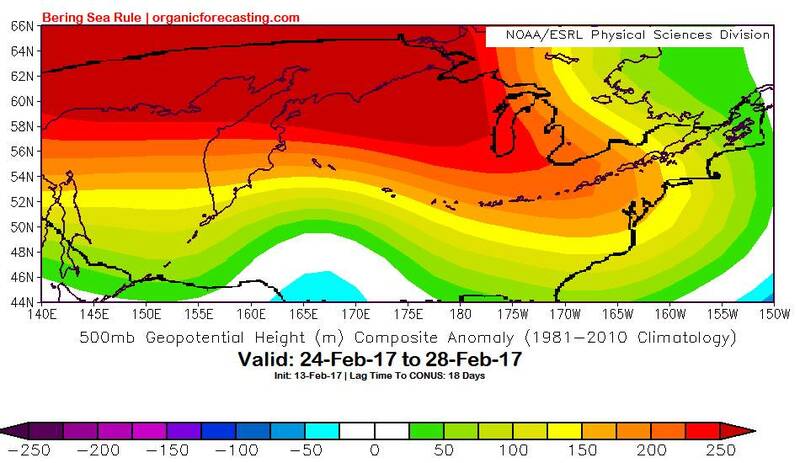 Mr. Renken explained, “The stronger than normal jetstream slamming into California has been the overwhelming meteorological factor in our mild winter so far. And there is no sign of this factor going away. Plus Canada has been running way above normal temperature-wise. Combining these and other factors, I don’t think a pattern of sustained cold in the East will exist.” After the stormy period that’ll set-up around February 20-22 and into March, the BSR indicates a volatile back and forth temperature pattern with some cold snaps but the cold is generally muted. The BSR had this for the last 4 days of February. Boston, MA data showing the cold was "muted" as predicted. That being said, going from 25° above normal to 7° above normal is a nice cold front that I'm sure those in the region were happy to see. These are the 3 day ROC charts for the Mountain and Central regions. The Mountain 3 day ROC had the pattern, but not the magnitude during the same period. While the Central 3 day ROC was off by 3 days in the recovery. So, overall, I'd say that the BSR did quite well during the month of February!